ایان مک‌شین (اینگیلیسجه: Ian McShane) بریتانیالی دوبلور و اوْیونچو. 1962–گۆنوموز ایللر آراسیندا سینما ساحه‌سینده چالیشیب. 1999 Babylon 5: The River of Souls Robert Bryson, Ph.D.
1975 Space: 1999 Anton Zoref Episode: "Force of Life"
1976 The Fantastic Journey Sir James Camden Episode: "The Fantastic Journey"
1977 Roots Sir Eric Russell Episode: "Part Nine"
1978 Will Shakespeare Christopher Marlowe Episode: "Dead Shepherd"
1986 American Playhouse Willy Wax Episode: "Rocket to the Moon"
1987 Miami Vice Esteban Montoya Episode: "Knock, Knock... Who's There?" 1989 Minder Jack Last Episode: "The Last Video Show"
1989 Miami Vice Gen. Manuel Borbon Episode: "Freefall"
1990 Columbo Leland St. John Episode: "Rest in Peace, Mrs. Columbo"
2002 The West Wing Nikolai Ivanovich Episode: "Enemies Foreign and Domestic"
2003 The Twilight Zone Dr. Chandler Episode: "Cold Fusion"
2016 Game of Thrones Ray Episode: "The Broken Man"
↑ Grater, Tom (5 October 2017). "Lily Collins, Ian McShane, Toby Kebbell to voice 'Here Comes The Grump' (exclusive)". Screen Daily (Media Business Insight Limited). Retrieved 1 February 2018. ↑ 'Deadwood' Star Ian McShane Joins Showtime's 'Ray Donovan' (21 January 2015). یوْخلانیلیب30 September 2016. ↑ Ian McShane: why he'll always be an antiques dealer with a mullet (7 March 2016). یوْخلانیلیب30 September 2016. 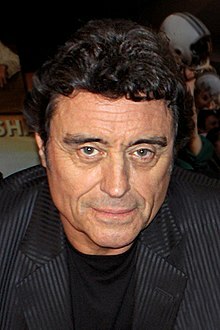 ↑ Ian McShane to Star in 'American Gods' for Starz. یوْخلانیلیب30 September 2016. اینگیلیسجه ویکی‌پدیاسی‌نین ایشلدنلری طرفیندن یارانمیش«Ian McShane»، مقاله‌سیندن گؤتورولوبدور. ( ۲۲ ژانویه ۲۰۱۸ تاریخینده یوْخلانیلیبدیر). قارداش پروژه‌لرده ایان مک‌شین گؤره داها آرتیق بیلگی‌لر تاپابیلرسینیز.